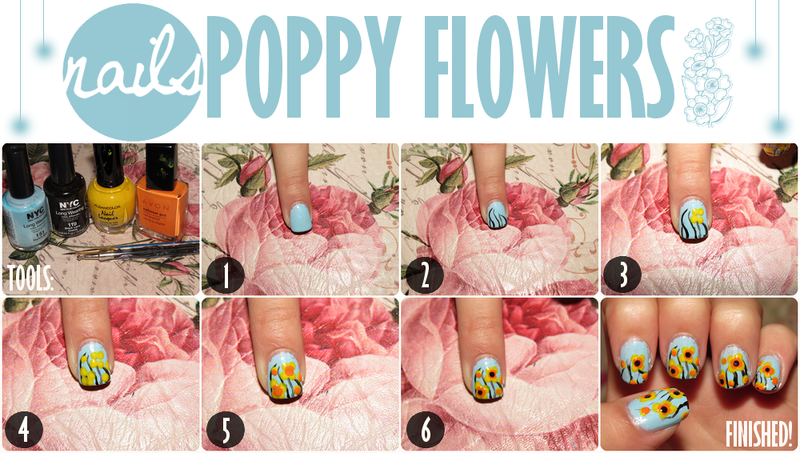 nail tutorial: (yellow) poppy flowers. i planned on making this tutorial and uploading during the beginning of may, but my laptop was going berserk. thankfully, my sister was kind enough to loan me hers, but all of my stuff was saved onto my laptop. luckily, my laptop seems to be doing just fine now! still, i'm making this tutorial super quick just in case my laptop decides to stop cooperating with me again. ★ before you begin, it is essential that you apply a base coat of your choice. this helps prevent staining of your natural nails. apply your background color and then wait for it to dry completely. using your line art brush, make about 4 or 5 black, wavy lines starting from the edge of the nail. these will be the stems. stop them about halfway through the nail. don't let them reach to the cuticle and don't over do them! to make the poppy, add four large dots in cluster. each nail should have about 2-3, depending on how big your nail is. when all of your poppies are done, add a few random, single dots for a little something extra. these will be the little buds! finally, add a large black dot in the center of your dot clusters/poppies. leave the single dots alone. ★ when your design is finished drying, apply a top coat to make your manicure last, and to add an extra shine! ★ use a q-tip or a flat brush dipped into nail polish remover to clean up around your nails. remember that there are different colors of poppies like red and purple, so change the colors to your liking!